Why Choose The Holloway Group? A Home for All Hobbyists!! 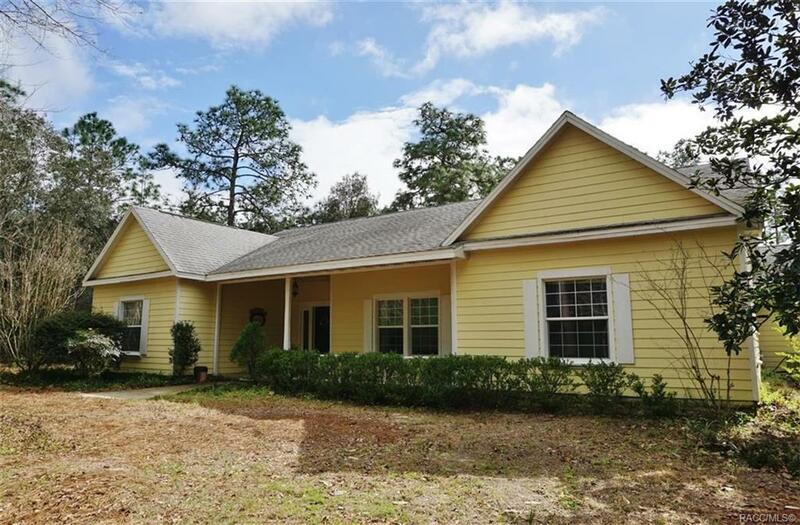 This country style home on 2.5 acres sits at the end of a long drive through the wooded front acreage. Welcome your guests on the front porch & invite them in to this open floor plan with ceramic tile flooring that flows throughout the home. The great room has French doors to the lanai & pergola where you can enjoy the back acreage with fruit trees, picnic area & outbuildings with electric (24X15 & 16X12) - workshop, studio, play house, man cave - endless possibilities. The master suite with spacious master bath connects to a 14X11 room that could be a den, office or nursery. Garage has been converted to an art studio with a full bath & could be converted to an in-law suite. Farm animals are welcome here. Directions: From Hwy 44 (Gulf To Lake), Go West On Southern St., 1st R On Roselyn, L On Sandy Hill To Property On Left. "Located in the heart of downtown Inverness"
© 2019 Citrus County Board of Realtors. All rights reserved. Information deemed to be reliable but not guaranteed. The data relating to real estate for sale on this website comes from Citrus County Board of Realtors and the Broker Reciprocity Program.sm. Real estate listings held by brokerage firms other than The Holloway Group, P.A. are marked with the BR logo and detailed information about them includes the name of the listing brokers. All measurements and all calculations of area (i.e., Sq Ft and Acreage) are approximate. Listing broker has attempted to offer accurate data, but buyers are advised to confirm all items. Information last updated on 2019-04-24.